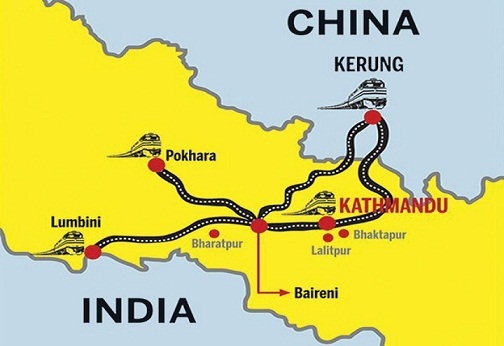 Nepal and China will develop a cross-border railway line connecting the Tibetan town of Kerung with Kathmandu. The two countries inked an MoU at the Great Hall of the People in Beijing on Thursday. Nepal Premier KP Sharma Oli and his counterpart Li Keqiang were making warm exchanges as senior officials from both the countries signed several MoUs. “The two sides have underscored the railway project as the most significant initiative in the history of bilateral cooperation and believed that it would herald a new era of cross-border connectivity between the two countries,” the joint statement said. “It would be wiser to discuss specifics once you have the detailed project report,” an official said. According to Nepal Foreign Minister Pradeep Gyawali the DPR of the Kerung-Kathmandu railways will be completed within one-and-a-half years of time frame. Prime Minister Oli, who started his China visit on June 19, travels to Lhasa early Friday. In Tibet, he will visit Lhasa, the capital of the Chinese autonomous region. Nepal home minister Ram Bahadur Thapa, foreign affairs minister Pradeep Gyawali, energy minister Barsha Man Pun and physical infrastructure minister Raghubir Mahaseth are part of the high-level delegation led by Oli.